With BendPak's 10,000-lb. capacity XPR-10XLS symmetrical two-post lift in your shop, most cars, trucks and SUVs will be raised quickly and effortlessly. Fully ALI Certified, this model features an extra-high lifting carriage. The taller carriage offers an extra 6" of lift, which means vehicles can be raised a full 75" (about 80" with adapters). Taller mechanics will enjoy this feature, since it means they no longer have to bend, stoop, strain and even injure themselves while they spend hour after hour working underneath lifted vehicles. There's no car lift quite like the XPR-10XLS. This is the symmetrical version (an asymmetrical version is also available), and it's ideal for shops and operators that deal mainly with vehicles whose centers of gravity are toward the center of the car. Of course, trucks and SUVs can be used with this model as well. Some prefer asymmetrical lifts because they allow a little more door clearance, while other prefer vehicles to be positions as close to the center of the lift as possible. There's no right or wrong—the choice is yours! The 59" carriage height on the XPR-10XLS is the highest in class for our 10K two-post lifts. You’ll be hard-pressed to find a safer lift at a better value for your taller techs. Finally, tall mechanics can work ergonomically—no more painful stooping! Gouge and tear-resistant polyurethane pads are designed to last longer than others. They're fast-rising and easy to adjust to the perfect height. We even throw in a set of 63 mm stackable adapters. BendPak's exclusive Low-Pro arms are perfect for low ground-clearance cars, trucks and SUVS. The arms aren't actually lower to the ground, but when they telescope outward, the top of the arm channels remain closer to ground level. The design of the XPR-XLS-LP helps prevent damage that might otherwise occur to vehicle side skirts and/or undercarriages. 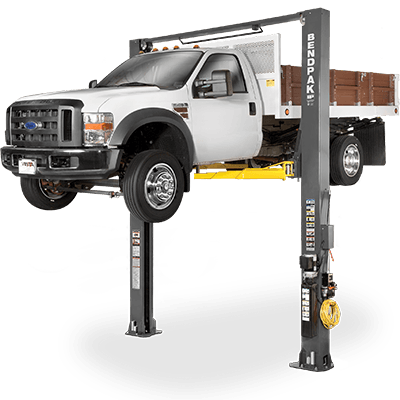 Thanks to a bolt-on extension, the XPR-10XLS-181 offers 181" of overhead clearance while maintaining the lift's safety and structural integrity. This effectively places your two-post lift among the tallest and most efficient models ever built. The XPR-XLS already features a taller lift carriage, and this extended-height variant improves on that by offering increased room for vehicles above—in addition to that room for taller techs working below. With the increased lift carriage height of the XLS, tall mechanics have an easier time working underneath. Add the Low-Pro arms, and low-stance cars are easily accommodated. Also include the bolt-on extension kit, and there's nothing too tall for this lift. The XPR-XLS-LP-181 two-post lift is by far the most versatile variant of this lift, and it's a must-have option for every busy auto shop nationwide. BendPak lifts are supplied with concrete fasteners that meet the criteria of the American National Standard ANSI/ALI ALCTV-(Current). Buyer is responsible for all charges relating to any special regional structural or seismic anchoring requirements specified by any other agencies or codes such as the Uniform Building Code (UBC) or International Building Code (IBC).